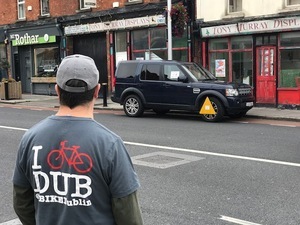 Vigilante ‘Clampers’ move to highlight a total absence of parking enforcement on the footpaths of Phibsborough Road, Dublin 7. 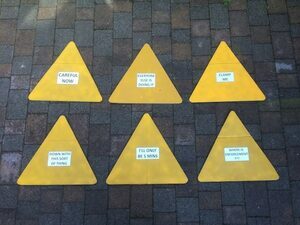 Cycle and Road Safely groups around the world have sat up and taken notice, but can Dublin City Council? Can An Garda Siochana? Posted in Misc and tagged Bike Lanes, Free the lanes, Phisborough at 10:14 am on September 17, 2018 by Bodger. 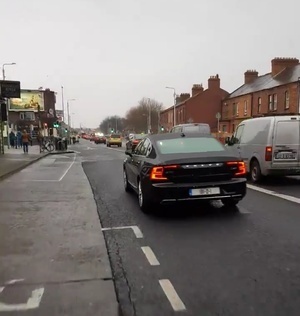 I cycle through Ranelagh twice a day, and unfortunately people treat the bike lanes as parking spots all day… You’re right, it does really p!ss me off to be honest! I can’t wait to park there later on this evening. Might even wait for a passing cyclist and sit smugly in my vehicle as they die of exhaustion making the epic 2 foot round journey to get past. I’m sure the vehicles that have to wait behind as the cyclist pulls out to clear your car won’t mind the hold up in the slightest. Well played Phizzfest & I BIKE Dublin! 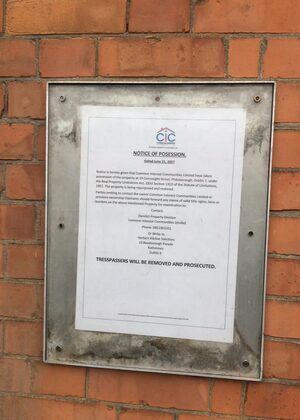 Any chance you could do the same in Ranelagh? Guards are too busy umpiring the Hutch-Kinihan shooting tournament to bother with piddley little law-breaking that might affect normal, non-murderous people. 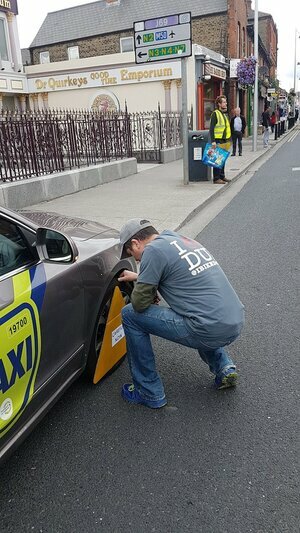 Guards are too busy whingeing to the Red Tops and INM about how badly they’re treated as they go about not upholding the law but supporting evictions. A while back, the infant son and I snuck into the Phibsboro tower and went to the top floor for a goo out the window at the lovely view. 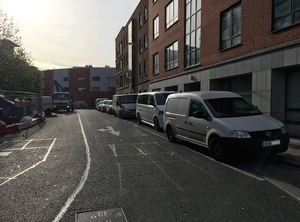 The 2 garda unions (GRA & AGSI) & their holiday agency (yes) have the upper floors there, which give a clear unobstructed view down on the little people trying to squeeze past these badly parked cars. Just in case they were minded to look out the window and see if the law needed enforcing. 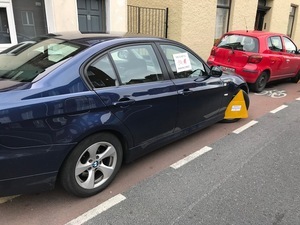 Would love to see the faces of those approaching their cars thinking they’ve been clamped! Cant wait to see people pinning giant stickers to the faces of cyclist who regularly break red lights. eh, you’re aware that traffic lights apply to motorised vehicles only? Brother B: 12% eh? I think you are running closer to 5% today…. Cyclists – you must obey the traffic lights and may only proceed past a green traffic light if it is safe to do so. That makes no sense. What have stickers got to do with red lights? And if they’re stickers why do they need pinning? And what of the motorists who regularly do the same? Ah yes, poor cyclists. Can’t criticise them for breaking red lights without mentioning motorists who do the same – whataboutery in its purest form. I see cyclists breaking red lights on a daily basis, weaving through crossing pedestrians. I see a motorist breaking a red light maybe once a day at most. It’s clearly a bigger problem among cyclists. If that’s what your eyesight is telling you then you clearly should not be driving. Dan you may need to look a little higher up the thread for the start of the whataboutery. I see a motorist breaking a red light … once a day at most. It’s clearly a bigger problem among cyclists. 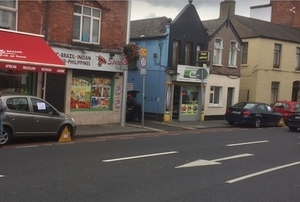 Whataboutery the old folks who might want to walk down the footpath without finding it blocked by a parked car? Whataboutery a parent wheeling a buggy who has to go out into a bus lane because some motorist wanted to pop into a shop for 5-30 minutes? Whataboutery people who haven’t brought a 1 ton obstacle with them? I was merely answering whataboutery with the same,and it’s perfectly valid in my point as the first one was entirely unrelated. I kept it on point. Anyway, lets take cars. I probably see between 25-50 cars go through amber lights on my morning commutes, a little less in the evening. I’d see around 10 going through a red both ends of the day. Now I have flexible working hours sometimes, so it’s often Time of Day dependent. I see cyclists do the same and I think they’re eejits too. There is a vast diffenence in the amount of danger they cause however. Let’s also talk about the spatial aspect. It is very easy to see how a handful of cyclists might squeeze through an amber, or even a red. You might only get 1 car going through a light before it is likely to cause absolute carnage and there is only so much road space. Road space is getting smaller too as cars are getting bigger. *I could also go on about Speeding Drivers (a serious, serious problem) Bus Lane drivers ( a big problem in Dublin) etc etc. Cyclists are an easy target, for whatever reason. Generaly because drivers gets frustrated by their slow journeys to work every day, that would be vastly quicker if they cycled, or in some cases even walked but choose to complain instead. But cyclists go through red lights, so your point is null and void. At Richmond Street South at Portobello cars are parked all over the footpaths regularly on both sides of the street, and right outside a FF councillers offices. 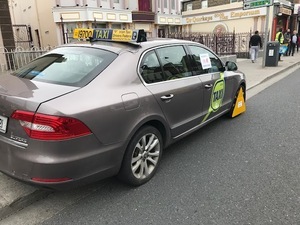 In Rathmines cars regularly just pull up and throw on the hazard lights to go to the McDonalds, despite a car park next door. Hazard lights seem to have become a ‘I can do what I like’ free pass. Everyone knows that hazard lights means “I’ll only be a minute” and allows you to park on double yellow lines, but only for a minute. it’s in the rules of the road, you idiot. Great initiative. 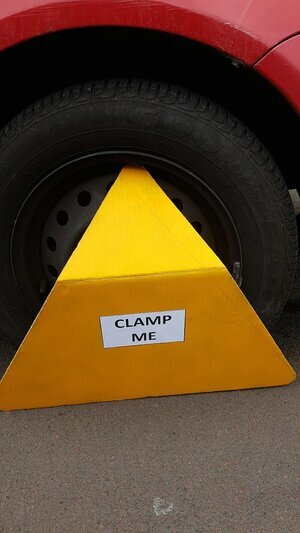 Love to see a Garda vehicle with one of these “clamps” on it. Even a vehicle with current motor tax. Stick a few on those hipster electric scooters in the ‘Batter as well. Just for the craic. ‘Vigilante’? Scarcely an accurate headline, Bodger. In relation to the whataboutery, I completely agree that cyclists who cycle fast on pavements should be fined. Going through red lights – in civilised countries the lights allow cyclists to proceed ahead before cars, which is safer for all. then immediately shelved. 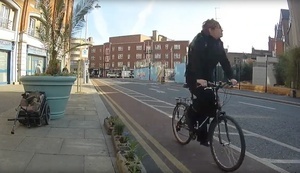 This ‘plan’ got Dublin the position of VeloCity for next year, which is going to expose Ireland as an utter laughing stock internationally when planners from all over the world arrive to look at the wonderful network we have (not) built and the resultant safety that we have (not) ensured for people riding bicycles. Building this network would get a substantial number of the ~80% of motorists who drive alone in their cars out and onto bicycles; it would mean a large number of the <2km spins that currently form 50% of all driven journeys would be on bikes rather than in cars. It would slash the terrifying rise of Type 2 Diabetes; it would save our children from dying from lifestyle-caused heart disease and strokes. It would cut the motor pollution that is 20% of Ireland's carbon footprint. It would release huge amounts of cash into the local economy rather than funnelling it out of the country into oil-producing states, etc. Half the problem right there, premature capitulation. He’s pokin’ fun in fairness, relax. Also, it was Phizzfest that used the phrase, in all fairness. …and it would give whiney right-wingers one less thing to whinge about.